Despite hopeful signs like the re-building of Marple Station doubts about the future of the Railways continued. 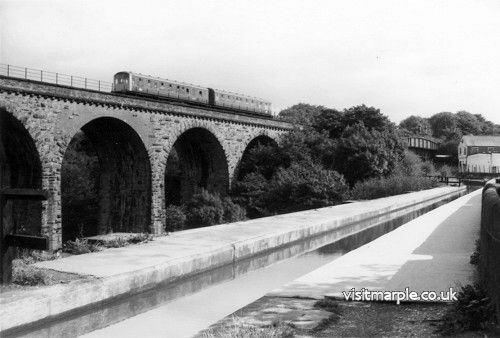 For one thing local Railways like the Marple line continued losing money; by 1970 the annual grant-aid for the Manchester-Marple, New Mills and Rose Hill services was in the region of £½m. Secondly, 1970 which had ended with the opening of the new Marple Station had begun with the Draconian measures of the closure of the Hayfield, Macclesfield and Woodhead lines. Railway closures continued into the mid-70's and after the trauma of the Beeching era, few believed any Railways were safe from closure, or even had any future. The motorway-building boom was at its height, car ownership rising fast and petrol cheap. Who needed railways? 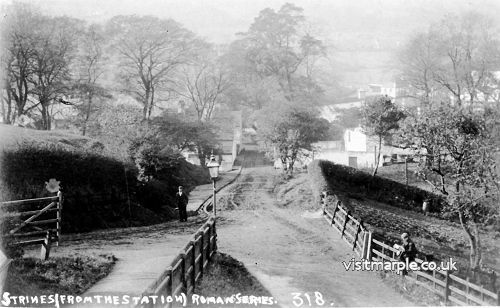 Strines viewed from the station in bygone days. B.R. 's losses continued to mount, despite the pruning of "dead wood" in the 60's, and the pressure to economise increased. Having found that closing lines did not in the long run pay off, efforts were concentrated on economising on the staffing and maintenance bill for those stations remaining open: the rebuilding of Marple had been directed to this aim. Accordingly in May 1973 work started on "rationalising" Strines. Until then Strines had remained a charming old fashioned country station. Admittedly the goods yard and warehouse had gone, and the staff reduced to signalman and a porter/clerk, but the solid stone buildings with hard Victorian benches, coal fires, and the deliberate tick of the old clock had little changed from the day the station had opened, while the whole place remained gas-lit. The last regular porter/clerk was Sid Cottrell, who was a character. Few passengers used the station after the morning peak, and in the early 70's the train service was sparse. Sid used to say that it was rare to take more than 30 "bob" (£1.50) after the morning "rush", though on a Monday morning he could take well over £50 in season ticket revenue. People even brought parcels to the station now and again. His other station duties included turning the gas lights on and off, and filling the signal lamps with oil - a duty which has now virtually disappeared with the use of electrical lights even in semaphore signals. Like many railwaymen, Sid was a keen gardener, and grew some flowers on the station, though his duties were so light that he spent much of his time in summer gathering the blackberries which grew profusely on the embankments, and cutting lawns for people living nearby between trains to supplement his income. Passengers requiring to purchase tickets may do so at their destination station, or at the station where they change trains. Passengers alighting from trains are requested to deposit their tickets in the boxes provided near station exits. Season tickets may be obtained by Postal Application to the Area Manager, Romiley Station, or purchased at destination station. There are NO Parcels facilities available. Train enquiries may be made by telephoning Manchester Piccadilly." *Again since writing, Strines Signal box has closed. And so Strines was converted into an unstaffed halt with the minimum of facilities - two bare platforms, a stark shelter on each, and automatic electric light - a far cry from the 19th C. station with its own station master and diverse buildings. What has happened to Strines is typical of many of the small rural stations which escaped the Beeching axe. While such economies are unpalatable, and have in many cases been excessive, such reductions in facilities have increased the chance of survival of many small stations, by reducing B.R. 's deficit. Strines is the only station in our area to have lost its staff, though Middlewood Low Level is now staffed on a one-shift basis in the morning only in common with many stations on the Buxton LNW line; Marple and Rose Hill are by contrast still staffed during the whole period trains run, i.e. 6 a.m. to midnight. The early 70's were marked by alterations to the structure of nearly every station in the district. At some such as Belle Vue or Hyde North, buildings were completely demolished and temporary "portakabins" erected, while at others such as Reddish North or Hyde Central the old buildings were retained in part and adapted to modern requirements. No station in the area has escaped modernisation, having survived since the 19th C. with very little change. Even at New Mills, which had survived almost unaltered since 1867, the Up platform waiting room was replaced by an open fronted stone shelter. One thing in particular has become universal - electric light. In 1969 the only stations between Manchester Piccadilly and Sheffield Midland (exclusive) via Reddish not entirely gas lit were Ashburys and Chinley. Some stations such as High Lane and Middlewood were still oil lit, and Middlewood remained so until 1972. By 1975 all stations were electrically lit in our area, Woodley being the last to enter the 20th C. in this respect. but the rationalisation of stations has been nowhere as severe as on some other lines, where all that has been left are bus-shelters and no staff. Most stations are still staffed, except e.g. Strines and Fairfield, and have retained some buildings. Not all the modernisation has been retrograde as electric lighting is certainly better than gas, higher platforms as at Bredbury, Romiley and Marple a boon to the less agile passenger, and stations are getting painted more regularly than in the 60's, when under the threat of Beeching cuts, maintenance almost ceased. Meanwhile in the early 70's petrol prices began to rise sharply, and the general public voiced resentment at the damage and pollution caused by road transport, as a result of a growing interest in environmental matters; there arose a considerable weight of public opinion that road and air, hailed as the answer to all transport problems in the 1960's, were not going to answer those of the 70's. Those in power took another look to the Railways, and decided that if road transport was not to overwhelm our lives, the Railways must not be allowed to decline any further, and in places must be improved, particularly in major conurbations. The spate of closures slowed down considerably after 1970, and died away altogether in 1975, since when lines and stations have been re-opened, or even built afresh. It was realised that the Beeching axe had been too severe but in most cases it was too late to repair the damage. If many lines had survived a few more years - say to 1972 - the turning tide would have probably prevented their closure -the Hayfield and Macclesfield Branches or the Midland Line through the Peak are cases in point. But now they are gone, and only now are we seeing the effects of the folly of excessive closures. 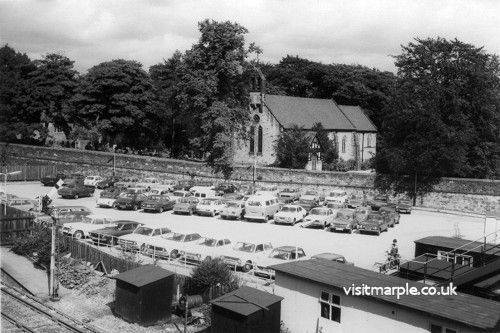 Marple Station and car park on 12 September 1978. A need for better public transport in the great cities had been recognised in the 1968 Transport Act, which set-u p Passenger Transport Authorities (P.T.A. 's) in the country's main conurbations. One of these was Manchester, where the P.T.A., set-up in 1969, embraced Manchester, Altrincham, Stockport, Oldham, Rochdale, Bury and Bolton and was entitled SELNEC. The P.T.A. 's were set-up to co-ordinate all public transport in their area; they were to liaise with B.R. over the running of rail services, but their main activity was operating bus services, which they took over from the former municipal corporations. Consequently for the first few years, little real interest was shown in railways. But a detailed study of the transport needs of the Manchester area completed in 1970 concluded that an efficient public transport network was the only way to maintain the environment of the city and its suburbs. In particular it was essential to tempt car owners to use the Railway by improving the services. The most far reaching proposal was to construct an electrified underground link between Piccadilly and Victoria Stations - and thus nicknamed "Picc-Vic" - to link up the systems North and South of the city, sundered since 1844. While the Picc-Vic Tunnel would not have directly benefited the Marple Lines, which would continue to run into the Main Line platforms at Piccadilly (High Level), inter-change with the Picc-Vic would give better access to city-centre as well as Victoria Station and places North of Manchester. But the plan did propose up-grading the Manchester-Marple, New Mills and Rose Hill lines, with more frequent services, modernised stations and bus-rail interchanges at key stations. While this seemed to assure a rosy future for Marple, New Mills and also Rose Hill, which only escaped closure by the skin of its teeth, the SELNEC plan tended to categorise too many lines as "hopeless cases" for closure - e.g. the Hyde loop. Another ludicrous idea was to close the Buxton LNW line beyond Hazel Grove, and convert the trackbed into a bus-way; largely one suspects because the SELNEC area ends at Hazel Grove. Marple Goyt Viaduct on 12 September 1978. A subsequent plan of 1972 proposed electrification to New Mills and Rose Hill, and the construction of a East-West tunnel to complement the Picc-Vic link. This was to be a deep level tube, called the Deansgate Tunnel, running from a deep level station at Piccadilly, under the Picc-Vic station to join up with the MSJA near Deansgate. The Marple and Glossop services were to be funnelled into the deep level Piccadilly by means of a dive-under at Ardwick, and run through the tunnel to Warrington and Altrincham - an ambitious scheme altogether. The Picc-Vic scheme obtained Parliamentary Assent in 1972, but in 1975 the Labour Government told Manchester there was no money for the Picc-Vic scheme. Since then the scheme has remained dormant, officially disowned by the Conservative Greater Manchester Council; but many, myself included, regard it as the only eventual solution to Manchester's transport problems, and the bedrock on which all public transport planning should be based. The scheme failed because SELNEC spent too much time in long term planning, and too little in actually getting the work started while the money was available, as Liverpool or Newcastle did. Since then a proposal has appeared to link the railways north and south of the city by means of the Castlefield Curve between Deansgate and Salford Stations, which would allow some north south running. It would be however only third best to the Picc-Vic scheme, and not give rail access to the city centre. Since 1974 however the "Centreline" high frequency mini-bus service has operated between Piccadilly and Victoria, providing at least some form of cross-Manchester link. SELNEC took over financial responsibility for running Manchester's local rail services on New Year's Day 1972: incidentally the amount of support for the Manchester-New Mills/Rose Hill service was £475,000 in 1973. Then in the Local Government re-organisation of 1974, when Marple ceased to be in Cheshire, SELNEC became Greater Manchester Transport (GMT). Like SELNEC, the GMT does not run the Railway services, but pays B.R. to do so, and has a large say in the planning of services. So far this has been of great benefit to all the lines in our district; the threat of closure at Marple and Rose Hill is now a dream, and even such lines as the Buxton LNW Branch and Hyde Loop seem secure. Slight improvements had been made by SELNEC to the Marple and Rose Hill services; the main one was the introduction of one extra Rose Hill-Manchester morning peak train, as Rose Hill had been left with a very poor morning service ever since the closure of the Macclesfield line. Marple also gained an extra Down morning and Up evening commuter train. But under GMT even more dramatic changes were made; from 2nd May 1977, a half hourly service was introduced between Piccadilly and New Mills Central, calling at all stations via Bredbury, instead of the erratic services via Hyde which had existed since 1970 when the Hayfield Branch closed. Thus the service to New Mills - and Strines - was increased nearly fourfold, from every two hours to half hourly; this gave New Mills its best ever service, especially with the Sheffield expresses calling, excelling even the post 1955 "modernisation plan" service; and Strines had an almost unbelievable service. Additional peak hour trains terminated at Marple, giving a much improved morning and evening commuter service; no off-peak trains however now terminated at Marple, thus removing the operating nuisance of having terminated trains reversing, and standing for periods in the station, causing delay to through express passenger and goods trains. 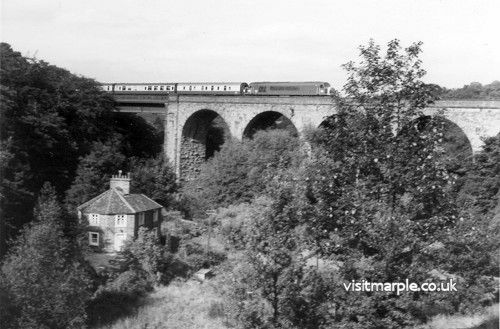 Marple Viaduct from the NW on 12 September 1978. 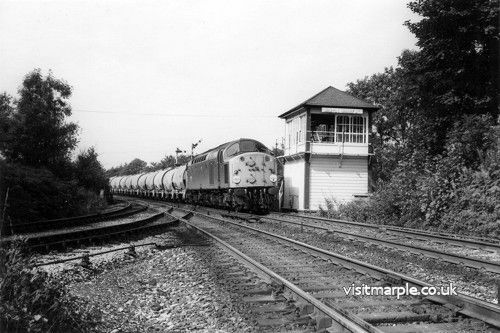 A novel feature of the May 1977 timetable was the re-appearance of express services calling at Marple, in the form of stopping the 17.24 express from Piccadilly to Sheffield and Doncaster at Marple. This was basically to give a fast evening commuter service to Marple. Arriving, non-stop from Manchester, in 16 minutes at 17.40, this is undoubtedly the fastest ever Manchester to Marple timing since 1880, when the Midland transferred its express services from London Road to Central: the 1875 timetable for instance shows several trains performing the London Road-Marple run in 15 minutes, e.g. the 16.50 London Road-St. Pancras reaching Marple at 17.05- such is progress Even more surprises were in store in May 1979 when the 17.24 ex Manchester, still non-stop to Marple, was extended beyond Doncaster to Cleethorpes, giving Marple through services to such places as Scunthorpe and Grimsby, which it has certainly never had before, not even in its pre-grouping heyday. Until 1977, with the decline of Midland main line services, only one Up and one Down main line train called at Marple each week: a semi-fast Sunday Liverpool-Sheffield train, and a return train, mainly for the benefit of hikers to the Hope Valley, giving Marple a once-weekly service to Liverpool and Sheffield! But now the Down service starts at Hull, giving Marple a Sundays only service from such places as Brough and Goole. These are however faint shadows of former main line glories. The May 1977 timetable operates at the time of writing with little change, giving Marple 44 Up and 42 Down trains, the best ever service between Marple and Piccadilly or its predecessor London Road; though the total of 86 trains is well below the station's main line heyday of the late 19th C., or the 1950's or 60's when Midland line trains still called. While the number of services to and from Piccadilly is higher than ever before, there have been more trains to and from Manchester in the past, though they had been distributed among two or three term mi. So while the timetable of today is a good one, it does in fact only restore the service to its pre-1970 level. But apart from the very occasional main line services, Marple has now for the last 10 years, since the withdrawal of the Sheffield semi-fast trains, been a completely suburban station, though this process towards this began as long ago as 1898 when the Midland decided to build the Disley cut-off. Rose Hill Station car park on 11 September 1978. But the May 1977 timetable also brought great improvements at Rose Hill. In 1970 with the closure of the Macclesfield line, Rose Hill had gained an hourly off-peak service, but a much worse peak-hour service, and lost its early morning and late evening services altogether. Now the morning peak service was doubled from 4 to 8 trains between 07.00 and 09.00, and the hourly interval service extended late into the evening, giving Rose Hill 24 Up and 26 Down services, which is undoubtedly the best ever service: but the fastest timing of 27 minutes compares unfavourably with 18 minutes achieved in 1875 One unfortunate feature of the 1977 timetable however is the routing of all off-peak services via Guide Bridge, though these run non-stop between Piccadilly and Guide Bridge to give a timing only slightly slower than via Bredbury. A better plan would be to run all Rose Hill services via Bredbury, and alternate New Mills services via Guide Bridge, the other New Mills service each hour continuing to be routed via Bredbury. ~he co-operation between B.R. and GMT did not however stop at an improved train service. For the first time for many years extensive publicity for the line was mounted, and connections between rail and bus services advertised: at Rose Hill for Hawk Green, and at Marple for Hawk Green, Mellor and Glossop Road, thus reviving an idea dead since bus and rail services parted company in the 1920's. There has however been no move to bring buses directly into Marple's forecourt, where a bus turning circle was proposed in re-building - and anyway there is now no room in the forecourt for buses, with the heavy usage by private cars. In 1976 the GMT introduced the "Saver Seven" scheme; previously a weekly zoned bus pass for the GMT area had been available; now its use was extended to include train services as well, the pass now gave unlimited travel on all bus services in the GMT, and in addition on all rail services within a specified zone, there being a choice of four rail zones, with different prices for each. The scheme was very successful and made through bus-rail journeys much easier; through Saver Seven the need for a weekly season ticket largely disappeared, though there is still a demand for seasons for a month or more. An unfortunate aspect of the scheme when first started was that Romiley was included in Zone 2, while Marple and Rose Hill were in Zone 4, involving a jump in price of the pass from £3 to £4 per week; as a result of this many passengers drove to Romiley, to the detriment of Marple and Rose Rill. After pressure however from the Marple Community Council (a body formed to represent Marple's interests after the merger of the former Marple Urban District Council into Greater Manchester), the zoning system was altered, so that the jump in price between Romiley and Marple or Rose Hill, now in Zone 3, is not so steep. GMT's overall control of services is now also to be seen on the passenger coaches of trains, where the GMT symbol of a stylised "M" can be seen painted on the coach sides. In addition to providing a better service at Rose Hill, the GMT decided to improve facilities at the station. The work was carried out by B.R. on behalf of GMT, and involved converting the former goods yard into a car park and bus turning area. As the goods yard was occupied by Bowden & Son, Coal Merchants who had stayed on in the yard after the withdrawal of goods trains, it was necessary to provide alternative accommodation. Work began in March 1977 to provide such accommodation in the triangle of land at the South end of the former goods yard. This involved removing some trees, which brought protests from residents nearby, and a rap on B.R. 's knuckles from the Stockport Borough Planning Committee for starting work before planning permission had been granted. However work proceeded, and slowly a car park was created in the centre of the former goods yard, and a bus turning area provided beside the South end of the Down platform; work was delayed until Bowden's were finally installed in their new coal yard, which was incidentally only a fraction of the size of the old yard, showing how much the demand for coal has dropped in the last 20 years. Meanwhile the Down platform was raised to the standard modern height and a new set of entrances and exits made, giving access to the new car park and bus stop from the Down platform. No work was however done on the Up platform, which remains very low; the clear implication is that the line will soon be singled and the Down platform only retained - an improvement long overdue*. Until this is done, arriving passengers are faced with a long roundabout walk to the bus stop and car park. The work was eventually completed in the Autumn of 1978, with access to the car park and bus stop by the lane formerly leading to the Council depot, instead of direct onto Stockport Road via the old exit, which would now be quite unsuitable with a blind bend on the hump of the bridge. Thus refurbished Rose Hill has very good road/rail interchange facilities, and superior to those at Marple, but as yet the car park is not so well patronised, and the connecting bus services do not run into the yard. *Since writing, the Rose Hill branch has been singled - as from Sunday 27th July 1980 - and the Down platform is now the only platform. The Rose Hill line being turned into a single line, taken by R P Smith on 26 July 1980. Even more dramatic has been the opening of completely new stations, something which would have seemed inconceivable in the Beeching era so few years before. Work started late in 1976 at Brinnington, between Reddish and Bredbury, on a station to serve the estate which has grown up in post-war years. It was officially opened by the Lord Lieutenant of Greater Manchester on 12th December 1977 (though it was nowhere near complete) in a tape-breaking ceremony derived directly from the opening of Marple. Hard on its heels followed a new station on the Glossop line at Hattersley, just East of Godley Junction to serve another modern estate; in addition a complete and lavish reconstruction of Bredbury was completed in 1978. 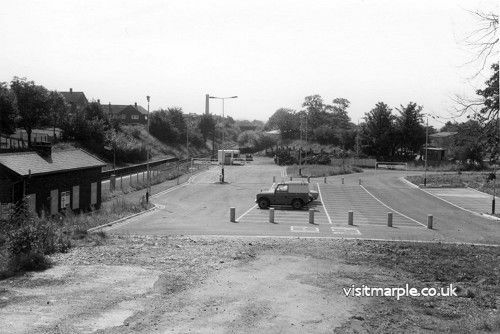 At Hattersley and Bredbury the schemes included large new car parks, and in all cases bus-rail links were an integral part of the scheme; Marple was thus the prototype new station for our area, and the success of Marple, particularly the car park has given impetus to these other schemes. It is interesting to note that these three new stations include platform canopies - obviously the lesson of Marple has also been learned here. The result of these improvements has been to enable the railways to retain their passengers in an era of rising car-ownership and even attract new custom, when otherwise usage would have continued to dwindle away. It is amazing how the tide has turned in the last 10 years. 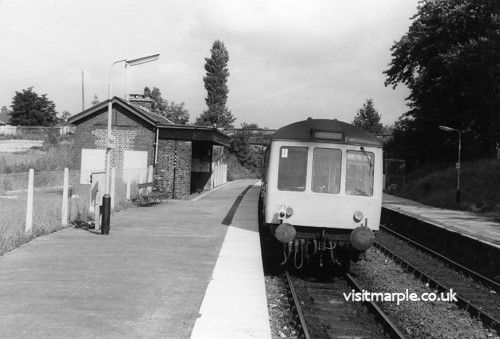 In 1969, closure was the watchword; no line seemed safe, and it seemed only a matter of time before Marple went the way of thousands of other stations. But now even the Rose Hill branch has a secure future - a line which escaped the axe by a hairsbreadth, and all the talk is of improvements not closure: such has been the reaction to the folly of mass Railway closures, and the unacceptable demands of road transport on the environment. The lines in our area now have an assured future - of that there is no doubt. The main line through Marple is particularly secure, in that it carries the three basic types of Railway traffic - express passenger, suburban and freight. With the closure of the Woodhead and Midland Disley Tunnel/Peak District lines to passengers, the route through Marple is now the only Inter-City route Eastward from Manchester. The express service is hourly between Manchester and Sheffield with alternate trains calling at New Mills. Since May 1979 the whole Manchester-Sheffield service has been re-organised, as part of a general improvement to Trans-Pennine services. The Manchester-Hull service is now concentrated on the Hope Valley Line, instead of the LNW Standedge route, and additional services provided between Manchester and Grimsby and Cleethorpes. This was basically done by linking up the existing Manchester-Sheffield expresses with existing, but improved, services east of Sheffield, and providing better coaches in the form of "cross-country" d.m.u. 's displaced from services elsewhere in the country. These are to be replaced by loco-hauled main line trains in the near future. Most of the trains, which are hourly, now extend to Doncaster, and beyond there three each way run daily between Manchester and Grimsby and Cleethorpes, and ten to and from Hull. The principal express train passing through is however the daily service each way between Manchester and Harwich Parkeston Quay, where it connects with Continental boat sailings. This is the only regular loco-hauled weekday passenger train to use the line, unless you count the 02.10 (a.m.!) from Manchester to Lincoln, which is basically a newspaper train bound for Grimsby. Summer Saturdays however see a great variety of holiday trains passing through, including services to Skegness and Yarmouth, and between Sheffield or the Midlands and Blackpool or Llandudno. On Sundays however runs the last vestige of the Midland service, in the form of two trains each way between Manchester and St. Pancras. These call at all stations of any importance, including a reversal at Sheffield, and take between 5 and 6 hours - a far cry from the 3 hours 35 minutes of 1904 or the 3 hours 10 minutes of the "Midland Pullman" of the 60's! There are also now rumours of a revived Manchester-Nottingham service which would use the route through Marple. The local service has already been described, and with the express service gives a line density off-peak of 3 passenger trains an hour South of Marple Wharf, and 4 an hour North thereof. Into this has to be slotted a heavy freight service. Most of the freight traffic consists of limestone aggregate from the Buxton area passing in "company trains", which are block train loads of private wagons run specifically for one customer. The largest such flow is from l.C.l. Tunstead with 11 trips weekly to distribution depots at Miles Platting and 16 to Dean Lane, Newton Heath. There are also lesser flows from Dove Holes Quarry and Topley Pike to Salford and Pendleton respectively. An oil train also runs once-weekly from Port Clarence on Teesside to the Quarries at Hindlow. There are in addition conventional mixed "wagonload" freight services: each night a through service leaves Peak Forest Yard for Healey Mills Yard in Yorkshire using the Marple route; and six times a day trips run each way between Peak Forest Yard and Dewsnap Yard, Guide Bridge, moving miscellaneous traffic such as coal and general merchandise for Buxton, and lesser flows of limestone and lime products for use in chemical and construction industries. 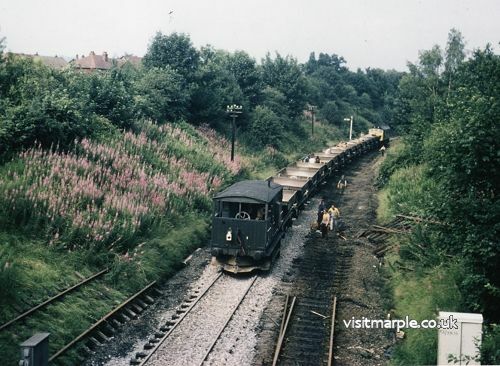 In all about 25 freight trains use the Marple route daily, and each year l½m tonnes of freight pass through Marple Station (or including empty workings and taking the gross laden weight – 3½m tonnes) with virtually no environmental damage. Finally the route is used by parcels services from Manchester Mayfield to St. Pancras and Sheffield, and by overnight newspaper services to Sheffield and Cleethorpes. All in all, the line carries a very diverse flow of traffic, giving it a secure future as an essential freight and passenger route. There is also a heavy flow of traffic of about 14 company trains each way daily from the Buxton area to the I.C.I. works on the Cheshire Plain, via the Disley Tunnel route. 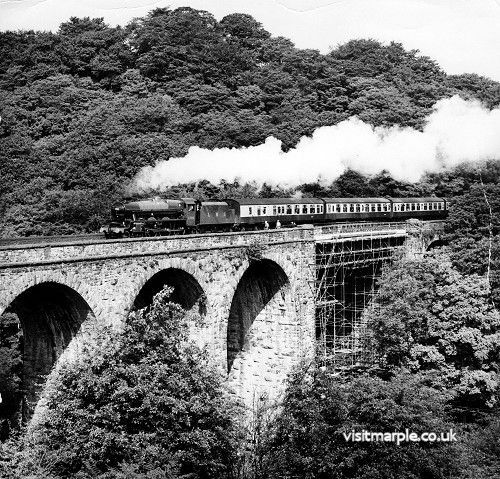 The last few years have also seen the re-appearance of steam hauled specials on the Marple route. This is because the Guide Bridge-Sheffield route is "passed" for use by privately owned preserved steam locos, usually originating from the Steam Centre at Dinting, or Carnforth, or the National Railway Museum, York. Each summer this brings a number of steam locos through Marple, including locos such as the A.4 Pacific "Sir Nigel Gresley", never before seen on the route. Undoubtedly the most celebrated visitor was "Flying Scotsman" in 1973 en route from exile in America to Derby for overhaul, when about 1,000 people crowded on and around Marple Station to see it pass through. It is pleasant to see steam hauled trains on the line particularly behind Dinting's "Scots Guardsman", "Bahamas" or "Leander", which represent the types of locomotives once common on the L.M.S. Railway. At present the future of the Woodhead route, open for freight only since 1970, is in some doubt, as the electrical equipment is life-expired. The likelihood is that with the decline in the coal traffic on which the line depends, the Woodhead route will close, as it is the least viable of the remaining four Trans-Pennine lines, and carries no passenger service. The closure of Woodhead could divert more freight traffic onto the Hope Valley/Marple route, and thus further strengthen its viability. Extra traffic would however prove very difficult to get through in the peak, due to the number of local trains particularly between New Mills and Romiley. A major constraint on operating a dense service of mixed traffic over the line is the signalling system; the old arrangement of irregularly spaced mechanical signal boxes, and absolute block regulations with semaphore signals is not conducive to a rapid flow of traffic. By contrast the modern "Track Circuit Block" system allows trains to run at much closer headways, with colour light signals controlling the trains automatically wherever possible, with a consequent improvement in speed of operation. This form of signalling has been introduced piecemeal into the Manchester area, and in 1973 was extended from Ashburys to just short of Romiley, with the aim of extending onto New Mills. Seven years later, the Romiley-New Mills Resignalling has been implemented (on Sunday 27th July 1980). Under this scheme, the Signalboxes at Marple Wharf Junction, and Strines were closed, and signalling centralised at a new control panel at Romiley; this links up with the previous resignalling from Ashburys, while Woodley and New Mills Junction (at the Central station) - remain as manually - worked "fringe" boxes to the scheme. The line from Romiley to New Mills has been track-circuited throughout, and three aspect colour light signals in totally new positions so as to maximise line capacity have replaced the old semaphores. The Rose Hill branch has also been singled: it was originally intended that the single line should start at Marple Wharf Junction, but it was found that there was not room between the Viaduct and junction for the requisite point work. So a double line junction was retained at Marple Wharf, with the two tracks continuing round the curve far enough to allow a train to stand clear of the junction on each line: thus in theory it is possible for 3 trains to stand simultaneously on the Rose Hill branch, due to the new signalling and layout. This is a great improvement on the previous situation, when only one train could be on the branch at once despite the double track. Incidentally the Peak Railway Society are hoping to purchase Marple and Marple Wharf Signalboxes intact for preservation, and re-use on the Matlock-Buxton line they are intending to re-open. This will mark yet another stage in the massive modernisation of the Railways in our area in the last quarter of a century. In 1955, before the modernisation plan, B.R. were operating a basically 19th C. system relying on coal, iron and gas. The diesels arrived in 1955, but 10 years later steam was still common. At the beginning of 1970, despite the demise of steam, the physical appearance of our railway was still basically 19th C., with frequent mechanical signal boxes, manually operated, and basically Victorian in design and equipment. The signals were all semaphores, lit by oil lamps at night; the lineside equipment largely pre-dated the grouping and telegraph wires strode alongside the tracks. The stations were pure Victorian, with a profusion of cast iron, heated by coal fires and lit by gas or even oil. By 1980 the vast 19th C. station buildings have largely disappeared, along with much of the iron work. Modern concrete and wire replace the picturesque wooden fences; gas lighting and coal fires are a thing of the past. The old fashioned permanent way, with wooden sleepers, "bull-headed" rail with joints every 60 feet giving the distinctive "clickety click" is rapidly being replaced by modern continuously welded rail on concrete sleepers. The forests of telegraph wires and semaphore signals have disappeared replaced by modern cables and prosaic colour light signals. The signal boxes too have gone, as control is centralised: but this is nothing new - remember how the present Marple box replaced three old boxes when it opened in 1905? The physical appearance of our railway has probably changed more rapidly in the last 15 years than at any other time. Now only the permanent structure - the bridges and tunnels, and the actual alignment serve to remind us of the 19th C., along with such features as mileposts and gradient boards, though these too may disappear with metrication. Little however can be done to alter the alignment, and it is unlikely that the present speed restrictions on the line through Marple will be eased to allow higher speed, due to the sinuous nature of the route: there is a blanket speed restriction of 60 m.p.h. from New Mills to Romiley, with lower speeds of 45 m.p.h. in the sharply curved Marple South Tunnel and 50 m.p.h. at Marple Wharf. For some years it appeared likely that the Disley Tunnel route, which has remained open solely for "company trains" plying between Tunstead and I.C.I. Northwich, would close as the formation was required for a motorway in the vicinity of Hazel Grove. If this had occurred traffic would have been diverted via Marple and the "Marple Curve" at Romiley. The curve had therefore been left largely in situ since closure in 1967, in case this happened. When in 1975 the motorway scheme was abandoned, it became obvious that the "Marple Curve" would not be required in the foreseeable future, and the track was removed; though it is always possible that if the expense of retaining Disley Tunnel becomes too onerous, the Marple Curve may re-open. But the "Marple Curve" has come again into the news recently. Traffic on the road between Marple and Stockport has in recent years reached saturation point in the peaks. As a result early in 1979 suggestions were put forward to either widen the existing road or build a completely new route. The Marple Community Council however objected on the grounds that either scheme would ruin the rural approach to Marple and only generate more traffic. They therefore put a counter proposal to re-open the "Marple Curve" as a single track, and run a regular train service between Marple and Rose Hill and Stockport; the terminus in Stockport would be a re-opened Tiviot Dale Station, which is now very close to the Merseyway shopping precinct, and will be even closer when the precinct is extended. With free car parks at Marple and Rose Hill, and bus-rail interchange facilities at the latter, it should be possible to attract sufficient commuters and shoppers to the service to reduce the level of traffic on the road; and such a scheme would be a fraction of the cost of a new or widened road, would cause no environmental damage, and be of great benefit to those without cars. The GMT felt the scheme could not be justified at the present time, but agreed to attempt to safeguard the track bed from development, and asked MCC to undertake further studies into the feasibility of re-opening. The Marple Community Council has also been pressing B.R. to stop some of the Sheffield expresses at Marple, as it has better car parking facilities than New Mills, though it is unlikely B.R. will heed the suggestion; the Community Council has also been pressing for improved booking facilities at Marple. Romiley and New Mills both have the facility of booking tickets to main line destinations, but at Marple it is impossible to get a ticket for anywhere beyond Manchester or Sheffield - despite having regular, albeit limited, services to places such as Liverpool, Cleethorpes and Doncaster. This causes the passenger using these services considerable inconvenience in obtaining a ticket on the trains or at destination, and provides ample scope for fare evasion. What is more passengers travelling via Manchester Piccadilly to e.g. London have to leave the platforms to re-book. A station of the importance of Marple ought, like Romiley or Guide Bridge, to have the facility of booking tickets to principal destinations, and certainly to places - such as Doncaster - which can be reached by through train. In the long term, the GMT favours electrification to New Mills and Rose Hill, which makes sense in view of the increasing cost and scarcity of diesel fuel. What is more the d.m.u. 's providing the services on our line are in some cases nearly 20 years old, though only designed for 10 to 15 years of life. They are becoming increasingly difficult to maintain and unreliable; internally they give a very bad impression to the passenger, though some refurbished units are now appearing. It looks as though we are stuck with the d.m.u. 's for at least another 5 years, but they cannot last forever, and electrification will be the only sensible answer for a suburban line like ours. In conclusion, the last 25 years have seen our Railways at last emerge out of their 19th C. form; they have passed through an era of retrenchment, of closure and threat of closure, of demolition and reduction in services. The 70's however have seen a miraculous change, with the Railways passing out of an era of despondency; the last few years have seen a continuous improvement of services and facilities. Now, after 15 years of doubt, it seems that our Railways have an assured future into the 21st Century.